KUALA LUMPUR: When Prime Minister Datuk Seri Najib Tun Razak took over as the sixth prime minister on April 3, 2009, he set his sights on resolving domestic economic issues and tackling political reform. In his maiden speech over television as the nation’s premier, Najib even pledged to conduct a comprehensive review of the Internal Security Act (ISA) which allowed for the indefinite detention of people without trial, and even announced the release of 13 people held under the draconian act. He then unveiled the Government Transformation Programme (GTP), Economic Transformation Programme (ETP) and Political Transformation Plan (PTP), a reflection of his integrated and visionary push to transform Malaysia into a truly developed nation by 2020. For political transformation, Najib even suggested that the Barisan Nasional (BN) charter be amended to allow direct membership into the ruling coalition through four new kinds of membership in BN — affiliate membership, associate membership, Friends of BN and fourth, the BN Rakan Muda club. But the biggest transformation since he took over and regarded as Najib’s boldest step in political reform was the repealing of the ISA. In other words, the prime minister has delivered on his promise. According to MIC secretary-general S Murugessan, the prime minister would be remembered as one who was willing to make such a bold decision. 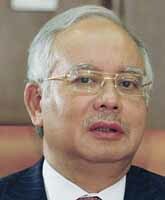 “It would be a lasting legacy of Datuk Seri Najib. As a lawyer, I feel relieved (about the repealing of the ISA),” he said. Senior lawyer Roger Tan said Najib’s courageous decision to repeal the ISA was the right thing to do and it showed that the government was receptive to the feelings on the ground. People nowadays, generally believed that no one should be detained without trial anymore, he said. However, Tan said by making such a bold decision, Najib was bound to face criticism even though it boded well towards having a more open society in Malaysia. “This is like the proverbial line of ‘damned if you do, damned if you don’t’,” he added. Selangor BN publicity chief and former MCA vice-president Datuk Yap Pian Hon said the repealing of the ISA showed that BN was changing and being more adaptive of the people’s views. “Initially, many people didn’t believe that Najib would do so. “But I must say that after the 2008 general election, BN has begun to listen to the people more, and not only that, it is taking action, as well,” he said. Yap, once detained under the ISA for 50 days during ‘Ops Lalang’ (Operation Lalang) in 1987, said Najib had shown that BN had been pro-active by listening to the people and it was not due to pressure from the Opposition. “The Opposition has been claiming credit for everything that the government is doing, saying that it is due to their pressure. This is their political strategy because they don’t have any political capital to whack the government,” he said. A political analyst from the Institute of Ethnic Studies at Universiti Kebangsaan Malaysia, Professor Datuk Shamsul Amri Baharuddin, believed the repealing of the ISA had nothing to do with pressure from the Opposition or the impending general election. “It’s more towards having a fairer society. The reason I say this is because the election is largely decided on the price of petrol, food, cost of living and jobs, but not on the ISA,” he said. He said the reason for Opposition parties to clamour that the repealing of the ISA was due to their pressure was partly because they had difficulty in pushing their ideas to the people and therefore, resorted to saying that the government had stolen their ideas, even from Buku Jingga, Pakatan Rakyat’s political manifesto. But the point is that Najib, as a reforming prime minister, has done it. And he has been getting many accolades for his decision. The Sydney Morning Herald commented in a recent editorial that Najib’s decision to rescind the draconian ISA marked a bold step in political maturity for Malaysia. “Najib needs praise and encouragement to keep going further, to make Malaysia the vibrant and creative country of potential,” it said. A blogpost in the Financial Times commented: “Najib is the toast of many Malaysian liberals after announcing an unexpectedly far-reaching package of civil liberty reforms. Najib is clearly emerging as a reforming prime minister. “The government has also taken a string of foreign policy initiatives, including a major improvement in relations with neighbouring Singapore, and the establishment of diplomatic relations with the Vatican. Sholto Byrnes, contributing editor of the New Statesman and a frequent commentator on South-east Asian politics and religion, wrote an opinion piece in The National in the United Arab Emirates that Najib’s decision had renewed Malaysia’s promise of a tolerant Muslim leadership. “This is why, reforms announced by Najib Tun Razak, are so welcome and could help make the country a beacon of hope, once more,” he said. “But the doubters have had the ground pulled from beneath their feet by this latest move (on the ISA). It unequivocally marks an expansion of freedom in Malaysia which any future government will find very hard to restrict again. Najib deserves some applause for his bravery,” noted Byrnes.